Are you going to be attending your dream college? What if cost and acceptance weren't an issue? Clearing the barriers to entry leaves you with The Princeton Review's annual list of "top dream colleges." Every year, The Princeton Review surveys students and parents every year to determine the "top dream colleges." You might be surprised to learn that Ivy League schools don't comprise the entire list. 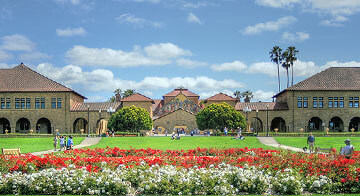 This year, Stanford University again took top honors for both students and parents, with Harvard University following in second place. In fact, Brown University and Dartmouth College are completely left off of both lists. Meanwhile, schools including University of Notre Dame, New York University, and University of Michigan (Ann Arbor) make strong showings on the surveys. Check out the complete "top dream colleges" rankings here. Where would you attend if cost and acceptance were no issue? We would love to hear your comments below.